Too often, our default view of the Middle Ages is one that over-emphasizes their fear: fear of hellfire, fear of heresy, fear of each other, fear of the unknown. Looking at the monsters growling and roaring and twisting around the pages of a medieval manuscript, it’s easy to dismiss them as simple boogiemen, meant to scare people into behaving themselves. But the medieval attitude toward monsters is much more complex than this. To the medieval mind, as outlined in the introduction of this book, monsters may be terrifying, but they’re divine creations, worthy of compassion and a chance at redemption. Beyond its incredible, stunning pictures, Medieval Monsters: Terrors, Aliens, Wonders by Sherry C.M. Lindquist and Asa Simon Mittman, explores the medieval love of monsters in all their glory and complexity in a book that transcends its purpose as an accompaniment to an exhibit – it’s a book in which to lose yourself in your love of medieval manuscripts. To be sure, one function of monsters is to frighten, and the section of the book called “Terrors: Awful and Awesome” addresses this head-on. 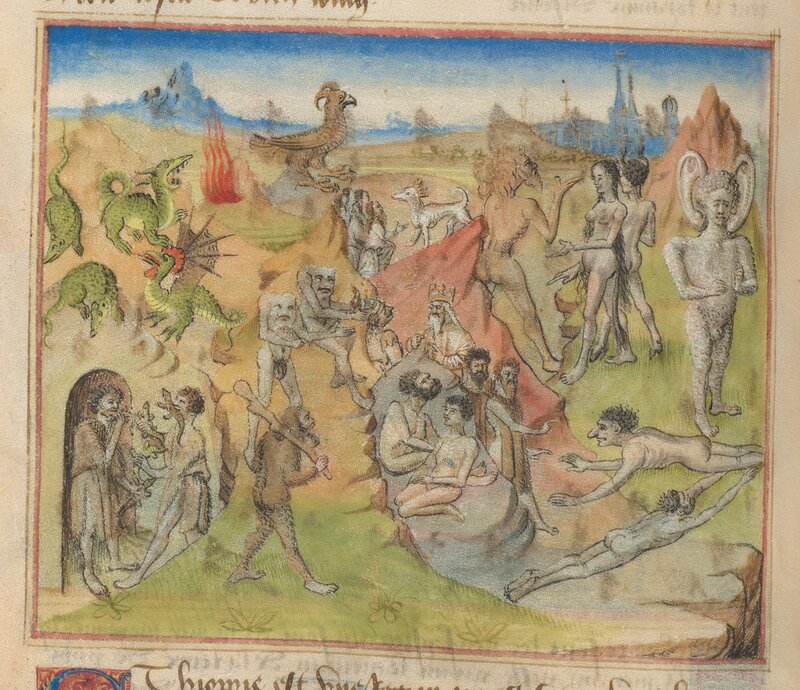 There are images of monsters menacing with claws and teeth, breathing fire, and devouring people, clearly meant to show the horrors that might await in the hidden parts of the world, ready to be defeated by great heroes and saints. Reference is made to maps in which sea creatures lurk – not coincidentally – along lucrative trade routes in an effort to scare people away. But there are also saints with bodies that have transcended the norm, such as Mary Magdalene, who (in the medieval version of her story) grew copious amounts of hair to cover her body while living alone in the desert. There are images of the Trinity as one body with three heads, images of the gospel writers as animals, and martyrs being tortured (the most disturbing, for me, being a flayed St. Bartholomew half out of his skin!). These images, though terrifying, were meant to inspire a sense of humility and awe about the mysteries of God’s power and his vision, and the authors take the reader step-by-step through the symbolism of each picture to explain the careful thought behind the image. The next section, “Aliens: Far and Near”, doesn’t deal with Martians, but with images of “dangerous” people. Here, the authors dive into the way prejudice was played out in manuscript illustration and other art forms, and the types of visual “codes” used as a shorthand to get an artist’s point across. Anti-Semitic caricatures of hooked-nosed Jews appear alongside images of fierce Saracens with their scimitars, beggars with bodily afflictions, and dangerous women with exposed breasts and loose hair. Even these depictions are not simple, however, as the authors explain: these figures are sometimes meant to inspire loathing, but sometimes meant to inspire compassion and understanding. In one of the most surprising images in the collection (featured earlier in the book), a fifteenth-century German tapestry depicts a horde of wild men besieging a Moorish castle or city. Although the Moors are depicted in unflattering caricature, they are positioned as civilized defenders against the light-skinned hairy creatures attacking them with sticks and rocks. Who is meant to be the “monster” in this tapestry? It’s intriguingly ambiguous. In the final section, “Wonders: Feeling the Monster”, the authors address what we might think of as “normal” monsters: creatures from bestiaries, Greek and Roman myth, and Revelations. Some of these monsters, like elephants, are perfectly adorable despite their purported dangerousness, and even the Whore of Babylon looks fabulous as she rides a creature “resembling more a sleek greyhound than the fierce spawn of the Antichrist”. As anyone who’s come across a picture of blemmae before will know, medieval monsters cross boundaries all the time, including boundaries between fierceness and cuteness. These monsters inspired wonder, as the authors point out, and appreciation for God’s imagination and power. I have to say, I love medieval monsters and have read other books about them, but Medieval Monsters: Terrors, Aliens, Wonders exceeded my expectations in every way. The pictures are big (the book is a full 9” x 11”), bright, and colourful, allowing the reader to see all the details, and there are a hundred of them, borrowed from the Morgan Library, The Met, and the Museum of Fine Arts, Boston. The accompanying text is knowledgeable, thorough in its description of the elements of each picture and the meaning behind them, and yet never boring, so it won’t scare off a casual reader with overly-dense prose. Like the boundary-crossing monsters within its pages, this book will appeal to people with no knowledge of the Middle Ages, and those who are already familiar with the period. It’s the best medieval art book I’ve seen in a long time, and I highly recommend it to art-lovers, monster-lovers, and medievalists, alike. Medieval Monsters: Terrors, Aliens, Wonders, was sent to us by its publisher, D.Giles, Ltd., in celebration of its release, and the opening of the Medieval Monsters: Terrors, Aliens, Wonders exhibit at the Morgan Library and Museum in New York, which runs from June 8th to September 23rd, 2018 (the exhibit will then travel to the Cleveland Museum of Art and the Blanton Museum of Art in Austin, Texas).